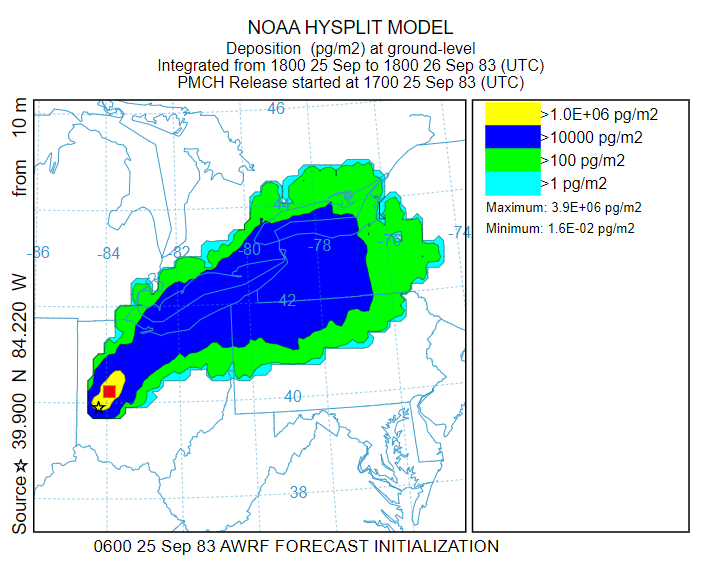 The term dry deposition in the context of how it is implemented within HYSPLIT refers to the depletion of pollutant mass from gases and particles when they interact with the ground surface in the absence of rainfall. Gases or particles within the surface layer will loose mass at a rate proportional to the deposition velocity. Also particles (but not gases) will gravitationally settle downward toward the surface where they can then be subject to dry deposition. Naturally all the calculations in this section are just examples because the PMCH tracer does not deposit. As in the previous example, start by retrieving the captex_control.txt and captex_setup.txt settings into the GUI menu. Open the Setup Run menu and change the run duration to 25 h and open the Configuration menu and reduce the particle number to 20000. And if you had not already completed the base case results, re-run the simulation and note the maximum concentration for each of the eight time periods. Compare the maximum concentration at the last time period with the base calculation in the previous section; they should be the same at 9000. Save the MESSAGE file to a unique name. From the MESSAGE file, note that at the end of the 25-h simulation the system mass is still 200981 grams with the profile showing about 15% of the mass within the four layers up to 265 m above ground level. 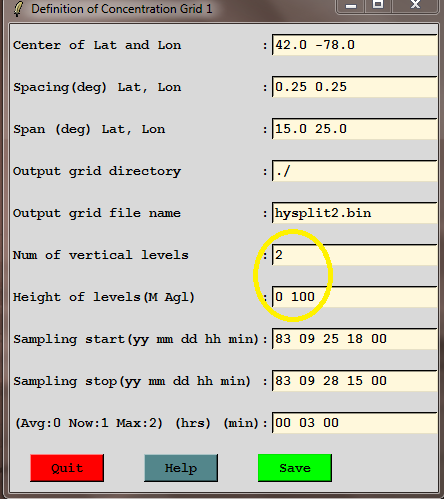 Open the Setup Run / concentration grid menu and change the number of vertical levels from 1 to 2 and add the level height of 0 preceding the 100 on the height of levels line. The deposited mass will be accumulated on level zero. Before proceeding, save the setup and configuration menus to deposit_control.txt and deposit_setup.txt these will be used as the starting point in all the remaining deposition sections. 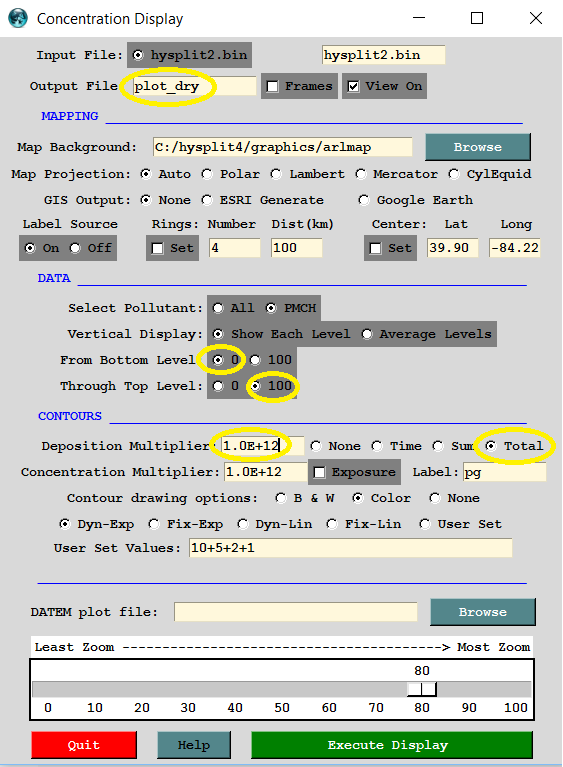 To compute gaseous dry deposition, open the Setup Run / Pollutant-Deposition-Grids / Deposition menu and change the deposition velocity, the first number in the second line, from 0.0 to 0.01 (1 cm/s a relatively high removal rate). The other entries on this line will not be discussed here but are required if the resistance method is going to be used to compute the deposition velocity instead of explicitly setting a value. One other change is required. 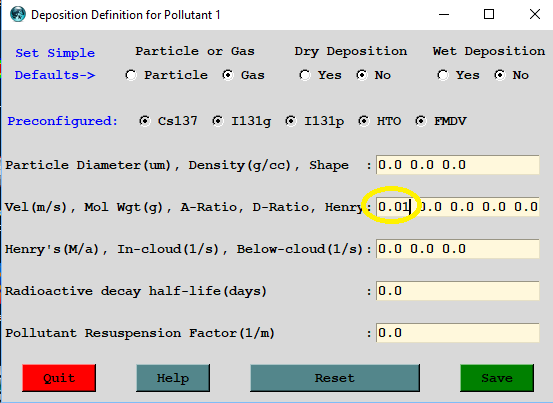 To be able to view the deposition amounts, rather than just its effect on air concentration, a deposition level needs to be added to the concentration grid. Save to close and then run the model. When it completes, open the display menu and insure that the bottom level radio-button for height 0 and top-level height 100 is selected. On the deposition multiplier line check the Total radio-button. This will show the deposition accumulate between sampling time periods rather that just showing the deposition for each time period. As in all previous examples, set the concentration multiplier and for these cases the deposition multiplier, the units label, and set the contours to Dyn-Exp if they had been fixed for one of the previous examples. As before, save the graphical results to a unique file name such as plot_dry. Execute the display and sequence through each frame and note the maximum concentration each time period. The last time period shows a maximum concentration of 2700. 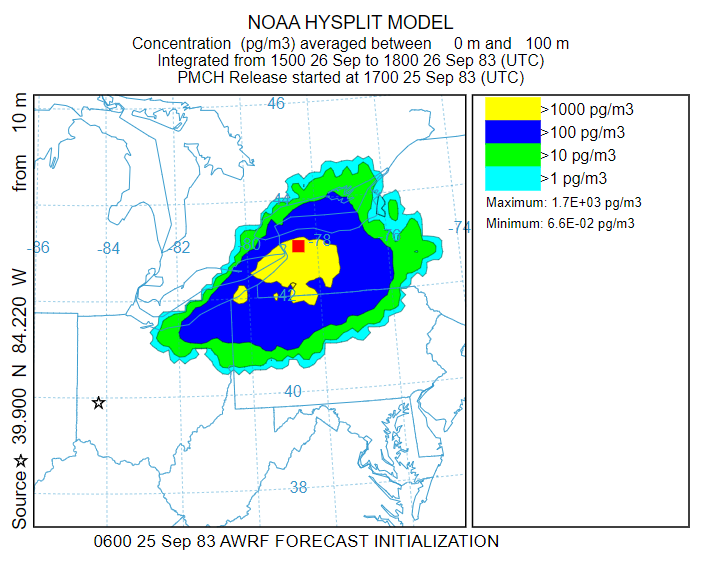 The total deposition frame is at the end and shows the deposition footprint as the plume passed over the region. 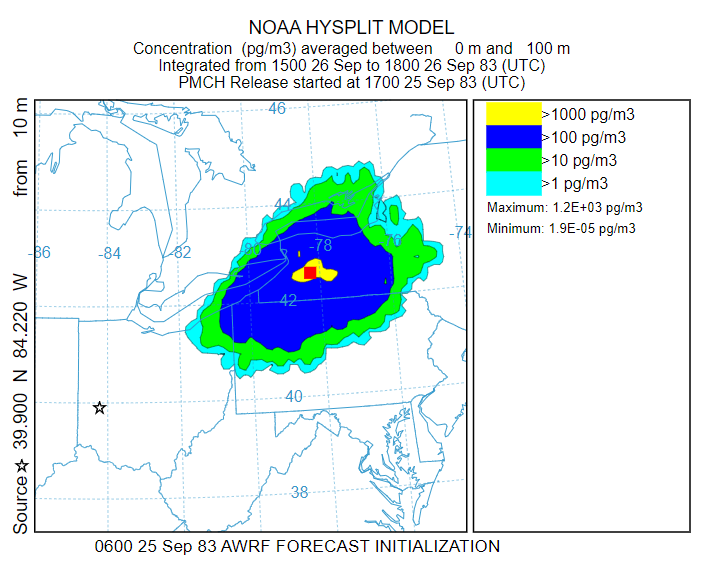 Check the MESSAGE file which shows a mass of 130115 grams and only 11% of the mass within the four lowest model levels. The non-depositing run showed a maximum concentration of 9000 at the end of the run. With only 35% of the mass lost to deposition, the deposition accounted for the factor of 3 decrease in the maximum concentration. The maximum concentration simulation results for the base case with no deposition and gaseous deposition, are summarized in the table shown below. Dry deposition of gases removes mass due to the pollutant's interaction with elements of the surface such as vegetation, buildings, or the ground. Particles may interact with the surface the same way, but particles also move into the surface layer due to gravitational settling. This will be discussed in more detail in the next section.